Experience tells me that it pays to be alert in the world of property. As a landlord and a property investor I'm always alert to potential scams. There's no such thing as a gift horse in this business. It pays to keep a weather eye out for the latest 'tricks' in the property business. That's why I'm grateful to the guys at Invest Connect for flagging up some potential issues. There's a sharp rise in the number of unscrupulous property agents and discount websites who trick property investors and landlords by claiming they can buy a property without putting any money down and involving them in mortgage fraud, according to Invest Connect. Investors and landlords are often offered property deals with the offer of a ‘no money down’ deal. This is sometimes achieved by an inflated value and a maximum loan-to-value mortgage taken out, for the full inflated valuation. The mortgage applicant declares they have paid more for a property than they actually did, usually stating the open market value as the purchase price. The intent is to obtain a mortgage loan for the actual price paid (sometimes even more) to end up with a no cost purchase. This is clearly an unlawful transaction as lenders would not grant a loan on these premises, if they knew. “It is unfortunate that too many property sales organisations promote the benefits of property investment, without fully explaining unlawful methods of acquiring discount property with a mortgage. "In any property transaction there must be total transparency, so that all parties know how the deal is being constructed. If you do not disclose the discounts by having the gross price put on the contract and having the property valued at the gross price, you are defrauding Land Registry and the Inland Revenue and laying yourself open to severe problems, should you ever be audited. "It is vital that investors and landlords ask the right questions at the outset. For example, can the ‘no money down’ firm to put their offer in writing, so you can get it checked by the Council of Mortgage Lenders and/or the Law Society? If it is a legitimate scheme, the company offering it to you will have no problem furnishing you with the information. The Fraud Act 2006 clearly defines the offence that will implicate any mortgage applicant(s), mortgage broker and legal adviser who failed to provide information, whether requested or not, that would influence a lending decision. • Are you being asked to sign paper work with differing headline purchase figures? • Has the value of the property significantly increased in a short period of time inexplicably? • Is the amount of the mortgage for the full purchase price of the property? • Is the deposit being paid by someone other than the purchaser? • Have you been asked to enter a price on the title that is greater than you know was paid for the property? Even if you rely on someone else, you are still responsible for ensuring due diligence has been appropriately conducted. If you suspect you are being asked to facilitate money laundering, you should consider making a disclosure to the Serious Organised Crime Agency. Red letter day for my boy Carwyn! It is a big day for my eldest son Carwyn today. He's just passed his driving test at the first attempt. I am a very proud dad. Da iawn! Well done, Carwyn! Blimey! I've been overwhelmed in the last 24 hours by the interest shown in the rescreening of my Secret Millionaire programme on Channel 4. The interest has been so great that my website http://www.kevingreen.co.uk/ crashed yesterday following the surge in traffic. There've been a few jokes (which I've hugely enjoyed!) about my bleached blond hair in the programme. Karen - "Absolutely choked with pride at your programme today. You are a wonderful person." 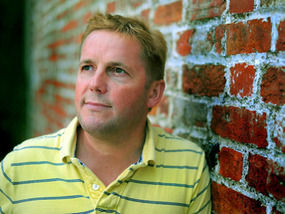 Gill - "Loving your kindness and generosity on Secret Millionaire. Heartwarming." 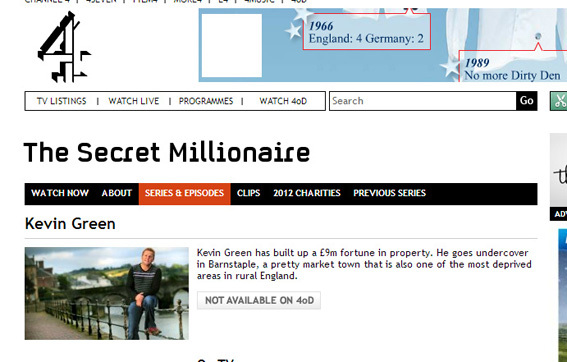 Panna on LinkedIn said - "Watched Kevin Green on Secret Millionaire this morning. Key learning for me was how he realised success wasn't just about focusing on making money and his business, but how his money can help change the lives of others." Patricia emailed - "I just watched the Secret Millionaire and was so touched by the help you gave those people. I was more touched by the loss of your sister to lupus at such a young age. I, too, have lupus and have had for 32 years. It has done a lot of damage to me, including losing a leg but every day I count my blessings." Lizzie emailed - "I just had to get in contact after watching the show to say what am amazing person! It really did touch my soul to see such a caring person helping so many people to have a positive future. To hear and observe a strong individual conquering life's challenges is inspiring. Kevin you are a star! None of us know how much we can shine until we have to!" Many thanks to one and all for your kind words. It was a very humbling experience taking part in the show and I was grateful for the opportunity to help so many people. It's been a great Saturday morning, helping one of my 90-Day Kevin Green Wealth Business Coaching clients. It's great when a client's passion and enthusiasm shines through. It's a joy helping them find the right direction for their talents. Picked up a copy of Swansea Life magazine today. I'm in there, featured in the 'Celebs on Eddie' spot which relates to the busy Swansea legend Eddie Whitney. I had a wonderful welcome in Belfast last night. 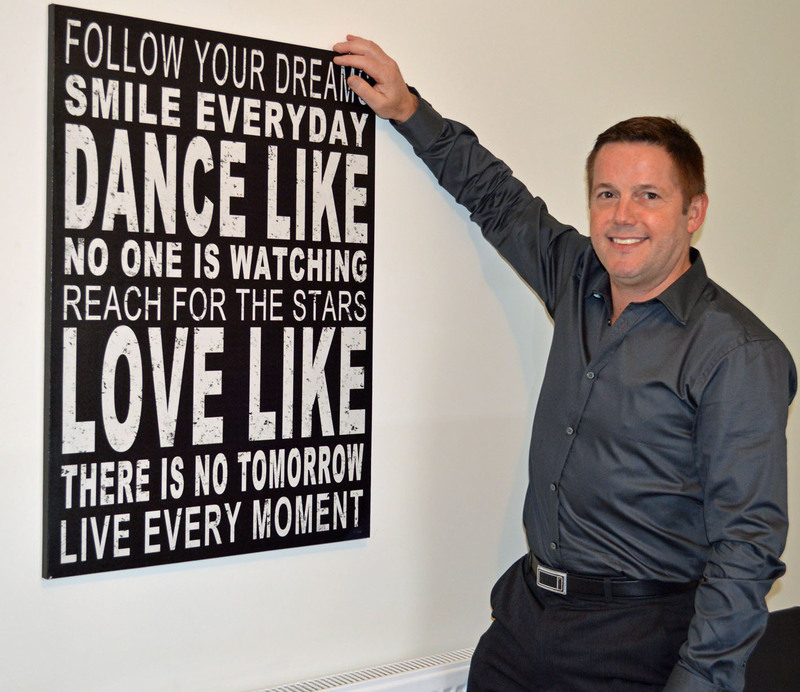 I was the keynote speaker at the 'Belfast Property Meet' event at the Ramada Encore. Belfast Property Meet is billed as the No1 networking event and meeting place for property people in Northern Ireland. The goal of the meeting is to bring landlords, investors, solicitors, surveyors and other property experts together to share ideas and expertise in all areas of property investment. And it certainly seemed to live up to the billing, with a high energy crowd at the Ramada. The event raised more than £2000 for the Make A Wish foundation. That meant a lot to me as I am an ambassador for make A Wish. I had a great night helping to raise funds for the Noah's Ark Children's Hospital Charity. I was one of the guest speakers at a 'Night of Champions' organised by my pal 'Dai the Fish', the great Paralympic champion David Roberts CBE. It was very humbling to meet such great Paralympic athletes. A silent auction helped raise thousands for the charity. Well done to everyone who helped organise such a wonderful and memorable event. Our new office is taking shape nicely. Here is one of the 'posh posters' in the boardoom. It all helps to put some inspiration in the mix . . . 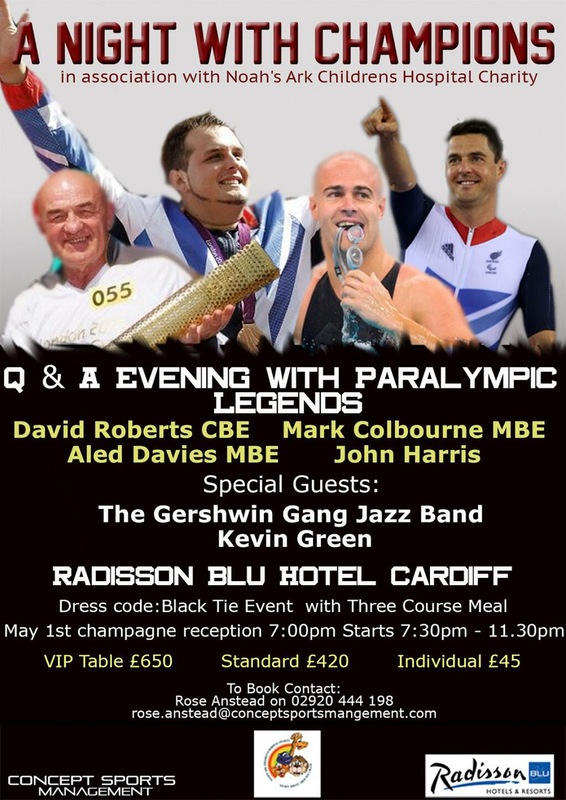 I'm really looking forward to this event tonight - A Night With Champions at the Radisson Blu Hotel in Cardiff. I will be one of the guest speakers - but top billing must go to some other inspirational speakers who will be at the event. My old pal 'Dai Fish', David Roberts CBE, will be speaking. David is a Paralympic legend and training hard for Rio de Janeiro in 2016. He's being joined on stage by Aled Davies MBE, Mark Colbourne MBE and John Harris. The evening is in association with the Noah's Ark Children's Hospital Charity, so we are all hoping to see a lot of charity cash raised on the night. As those who know me well will tell you, I love a bargain deal. Had a good one this morning when we found the coded car key on my son's Peugeot car had broken. The dealer price for a replacement was £180. A quick hunt around found a better deal. South Wales Locksmith Kelvin (07962062868) saved £££'s by fixing the key for only £40. So, the tip is, always shop around and never accept the first price on offer.